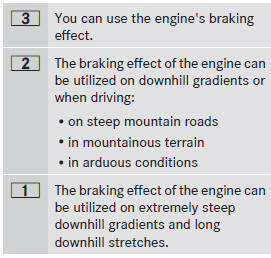 When the automatic transmission is in position D, it is possible to restrict or derestrict the shift range. ► Pull the left-hand steering wheel paddle shifter . If the maximum engine speed for the shift range is reached and you continue to accelerate, the automatic transmission shifts up in order to prevent the engine from overrevving, even if the shift range is restricted. ► Pull the right-hand steering wheel paddle shifter . The automatic transmission shifts up one gear and restricts the shift range to the relevant gear. ► Pull and hold the right-hand steering wheel paddle shifter until D is shown again in the multifunction display. ► Pull the left-hand steering wheel paddle shifter and hold it in position. The automatic transmission cannot shift down beyond second gear. To shift to first gear, you have to pull the left steering wheel paddle shifter.